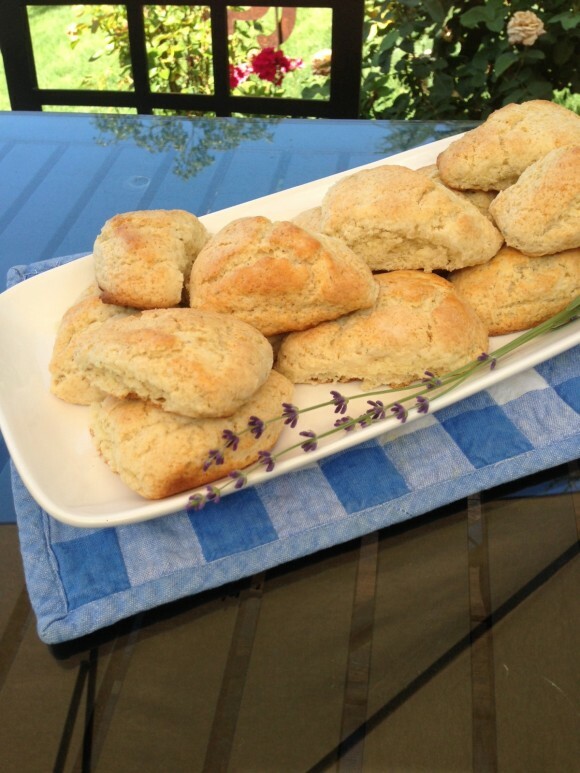 These sweet, fragrant scones are a great way to start your day or serve with tea when you need a relaxing break. Make sure the lavender you use is 100% organic as you don’t want to ingest any pesticides. If you don’t have lavender in your garden you can purchase culinary lavender at some supermarkets and natural food shops. Preheat oven to 425 degrees F. Line a large baking sheet with parchment paper. In a food processor, or by hand mix together all of the dry ingredients. Add the cold butter and process or mix by hand until your mixture resembles coarse meal. Add the vanilla to the buttermilk. In a large bowl, add the wet ingredients to the dry ingredients and stir until you have a “shaggy” dough. Transfer to a lightly floured surface and knead a few times, until a dough forms. Divide the dough in half, and pat into two 8 inch rounds. Cut the rounds into 8 wedges each and place the wedges on a large cookie sheet. Bake for 13 -15 minutes until golden brown. Transfer to a wire rack and let cool. To read about our trip to the Mt Shasta Lavender Farm click here.